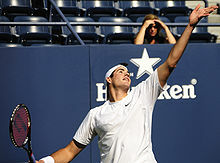 John Isner is an American tennis player who is known the world over for his towering height and mammoth serve. Isner has been one of the few bright lights for American men's tennis since the retirement of Andy Roddick, and has made full use of his abilities to carve out a respectable career. Moreover, his penchant for playing long matches has made him an object of attention even outside the US. Isner is an aggressive player who uses his serve and groundstrokes to finish points as quickly as possible. He also comes to the net quite often in order to put away volleys. Isner's forehand is his dominant wing, and he hits it very flat and hard. His topspin backhand is also quite flat but not as pacy, and he uses the slice backhand a fair bit too. Isner stands at or very close to the baseline at all times, which limits his ability to defend and retrieve. Isner's serve is a mythical shot, and easily one of the best that the sport of tennis has ever seen. Coming down from a height of 6'10", it has incredible power and precision, and even the second serve can have a speed of above 115 kph. Isner can hit his serve flat or with spin or with slice, and all of the variations are equally devastating. Isner's forehand is also a major weapon, and the flatness with which he hits it makes it a formidable beast. He has been known to blast some of the hardest forehands on the tour, and it is the single most important element of his game. Isner's return of serve is a liability, and he often goes entire matches without mustering more than a handful of break points. His backhand and movement can also be exploited by a strong opponent, and he spends a lot of his time in almost every match trying to mask those deficiencies. Isner was born in Greensboro, North Carolina, and started playing tennis at the age of 11. He moved to Tampa, Florida in order to train at the Saddlebrook Academy, and turned pro at the relatively late age of 22. Isner is married to Madison McKinley, and the couple welcomed their first child, a daughter named Hunter Grace, in September 2018. Isner has been a big presence in the American media by virtue of being the best player from the country since the retirement of Andy Roddick. But he has also achieved worldwide fame because of his serve, and his willingness to fight hard during the epic five-setters he often gets involved in. Isner has been part of both the longest and the second longest matches in tennis history - the 2010 Wimbledon first round match against Nicholas Mahut, and the 2018 Wimbledon semifinal against Kevin Anderson. His ability to keep producing big serves and big forehands even as a match goes well into overtime has earned plaudits from all corners. While he was brushed aside as a one-dimensional player at the start of his career, Isner has made several improvements over the years and now has a solid baseline game to go with his gigantic serve. He is widely considered an over-achiever who has made maximum use of his natural abilities, and as such is a great role model for aspiring tennis players all over the world. Miami Open 2019: Can John Isner make it two in a row by defeating Roger Federer in the final? Keeping the point alive: Are tennis games far too long?